Bake & Enjoy. 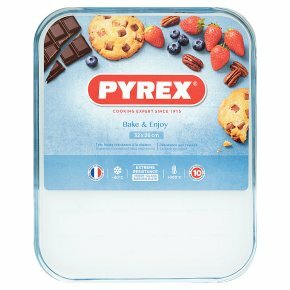 Superior ovenproof heat resistance. Scratch resistant. Extreme resistance. 10 year guarantee. 220°C thermal shock. 100% healthy material. Recommended use: in traditional and microwave ovens, dishwasher, refrigerator and freezer. Do not use: on top of stove (electric hob, gas burner, ceramic hob, etc. ); hot dishes on cold/wet surfaces; cold liquids in hot dishes; scouring pads/ abrasive powders for cleaning; items that have been chipped.